The Ribbon of Light at DSO ... more than 50 per cent complete. A leading player in design and project management sector in the UAE, Araco is the project consultant (leading design) for the Ribbon of Light and will be offering key services such as architectural engineering, structural engineering and MEP (mechanical, electrical and plumbing) engineering in addition to supervision and maintenance. 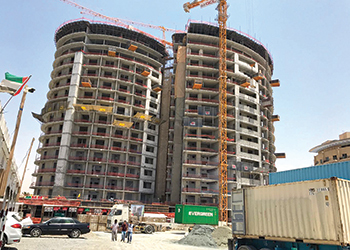 Covering a total construction area of 128,083 sq ft, the smaller of the two towers features 238 studio apartments, three lifts and a lobby, while the other one offers a combination of 240 one-bedroom apartments, 16 two-bedroom and 14 three-bedroom apartments. The upper storeys will feature 30 penthouse units, and the building will be serviced by six lifts across two lobbies. Across the entire development, 16 duplex apartments will be available. Commenting on the project, Araco general manager Rahim Banizaman Lari says: “In terms of design and function, this project will be an iconic landmark in an important area of Dubai. 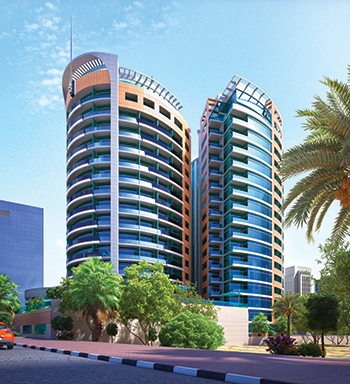 An artist’s impression of the towers. Italian façade specialist Zanetti has been appointed to complete all façade, glass and cladding work, maintaining a high level of quality throughout, says Araco which is working with project contractor Gulf Contracting Company and project owner Ribbon of Light Trading on the ambitious project. The ground floor units across both towers will provide seven large leasable retail units with community facilities including two large swimming pools, two kids’ pools, two Jacuzzis and two large gymnasiums. The development will also feature 708 parking spaces. Lari says both the towers have been designed in a cylindrical shape to offer unrivalled views across the city skyline. “This iconic structure, which will be visible for miles around, is not only a landmark within Dubai Silicon Oasis, bringing new investment to a developing district in the emirate and adhering to Dubai’s strict new environmental, safety and fire regulations,” he notes. With sustainability in mind, both buildings will be equipped with a chiller cooling system to reduce electricity consumption while maintaining optimum conditions for tenants and residents, compared to traditional air-conditioning. In line with Dubai’s new fire safety codes, the towers will also be fitted with the latest Civil Defence requirements he adds.